I remember having some form of acne as far back as third grade. I didn’t think much of it at the time, because not only was it barely noticeable to me, but it was something my mom and brother had always assured me they had at certain points as well. It wasn’t until fifth grade, when my acne became more prominent, that I began to truly take note of it. It would be a couple more years before my other classmates were struck with their bout of adolescent acne and this time period had a huge impact on my self-esteem, as I was always conscious of every blemish I felt on my skin. This consciousness is still very much present in my daily life as an adult dealing with acne. In my long-term struggle with the various spots on my face, there are two issues that became increasingly complicated: using makeup and picking at my skin. As I wasn’t allowed to wear makeup until I was in high school, I developed the first bad habit surrounding my acne well before I could obsess with how to cover it. Picking at your skin is generally the first thing anyone will tell you not to do to eliminate your acne, as well as the one thing that’s almost guaranteed to make it worse. Despite this knowledge I now have, I unfortunately only had my teenage brother for reference when I was first grappling with my acne, and following his example, I picked any spot I could find. My mom would always lecture us on how this would leave scars lasting far longer than any zit. She was right, of course; I have scars and remaining spots from years ago, yet I still have a hard time refraining from picking. As I was growing up, picking at myself become increasingly intertwined with my anxiety. I would fixate on certain spots for longer periods of time and find new areas, like my chest or nails, to pick at when I wasn’t near a mirror. This became increasingly embarrassing and anxiety-inducing as I entered adulthood and began to scar in other places in addition to my face. This is still something I struggle with, but finding certain ways to decrease my generalized anxiety often decreases the urge to pick at my skin as well. I’m constantly reminding myself that the less I pick, the less I will have to pick at and when I do mess up, it’s not the end of the world. It will heal if I let it. Because of my acne, I’ve always had a complicated relationship with makeup. As soon as I could wear any makeup I went straight to a full face of foundation every day. I was told again and again that this was not particularly good for my skin, but as someone who had acne long before being introduced to makeup, this was nothing but revolutionary for my self-esteem. I could finally wear my hair up in a ponytail and actually look people in the face. I still love experimenting with makeup today and seeing the different looks others can create for themselves as well. Makeup helped me immensely in building confidence, but my sense of self-worth became very dependent on it. I wouldn’t dare leave my house without a full face of makeup and eventually became uncomfortable even being in my own home or with my closest friends if I wasn't wearing makeup. For the first few weeks of college, a vast amount of my anxiety surrounded the shared bathrooms, and the exposure of my bare face to anyone in my hall as well as my roommate. I am very glad I do not feel this anxiety so intensely anymore. I have become much more comfortable with my skin in the last few years, not that my acne has decreased at all, I just have a lot less fear rooted in it. I can leave my room without full coverage foundation and feel comfortable swimming with my friends. I am still by no means always happy with how I look, as I still rely on some concealer daily and feel uncomfortable without makeup on around anyone other than my friends, but I’ve made significant progress in becoming more content with myself. 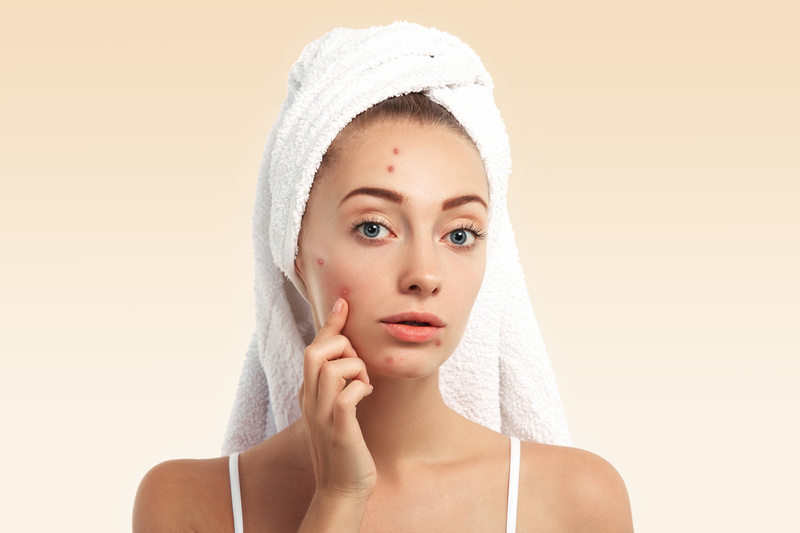 Dealing with acne seems like something only teenagers do and, if you're like me, you thought it would suddenly disappear when you became an adult, but it’s something many adults still struggle with. I chose not to try to make this an article giving advice on how to get clear skin simply because I know everyone’s skin is different. I spent years stripping my skin of any natural oils with astringents and toners that only made it overcompensate with even more oil, simply because that’s what had worked for other people. I only offer some solidarity for those who are also struggling with similar problems surrounding acne. As someone who often has issues with hyper-focusing on my perceived blemishes, it helps to remind myself that people usually aren’t concerned or often don’t notice the tiny things you may see as huge, significant flaws. It’s okay if you’re not always comfortable with your appearance and I encourage you to do whatever you can to feel most content with yourself. The first step in any basic routine is simply taking care of yourself.